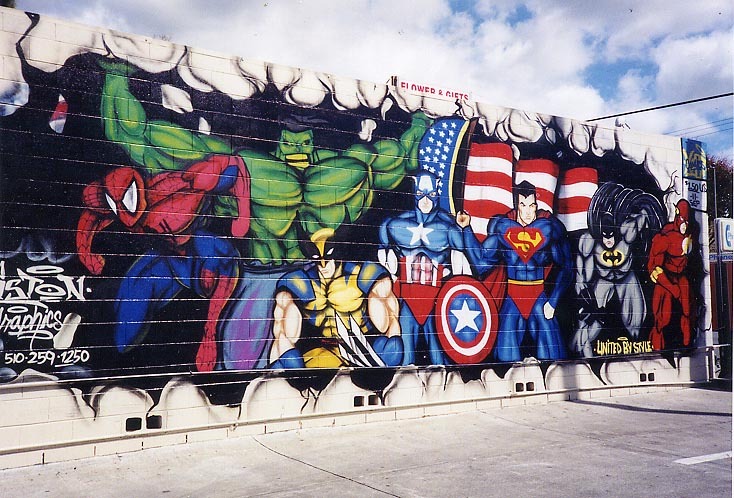 I like a good dose of graffiti art. Not the trash that's done by your entry level 'tag artist', who is generally after nothing more than to demean other people or mark their 'patch' for a quick three seconds of fame, but the kind that shows some actual artistic talent. While I can't quite make out the artists name, David says there used to actually be a comic shop on the other side of the wall. That means the heroes are actually busting out of your friendly neighbourhood comics source, and into your day - even the clouds in the background are promoting this! What a great crew too. I mean there's my 'Marvel Trinity' - Cap, Hulk and Spidey, the obligatory Wolverine, and the scarlet speedster Flash, stepping in for Wonder Woman, and fleshing out DC's side of the testosterone charged bargain. "United By Style" alright - thanks again for sharing David! So what about you? Do you have a bit of art or an artistic soul you think is 'o' for awesome? Flip it the IADW way in the comments section or drop me a line to the email addy on the right! thanks for putting that up on your blog Dan. this is probably the only claim to fame Hayward California has. i know a few people i'm going to send this blog posting to who'll get a kick out of it. No worries David - thanks again for sharing! You can give me a shout out with my art work anytime! I love that, I want to go see it in person now! Thanks Jimmy! If there's any particular stuff you'd like me to see - flip me an email! 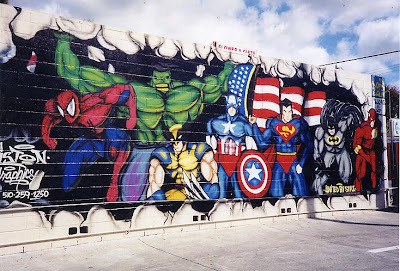 Is there any way you could get me the address to this mural? I am dying to see it in person!!!! :) Thank you! Hey Brandy, I'm in New Zealand so I'm not sure myself where in Hayward it is, but I have published your comment here in the hope some folk can.